HOME | Current Works potter : Janet Hyde | C.A.W. 2015 | Contact & Directions. 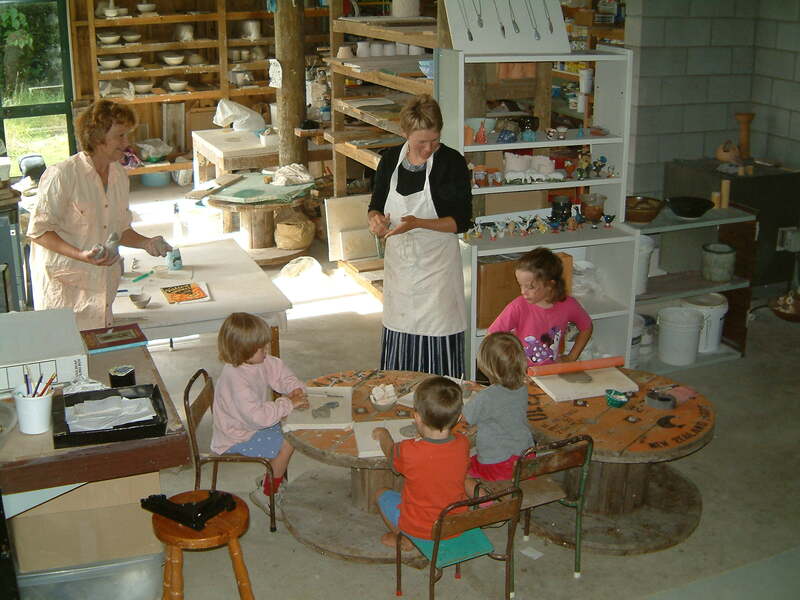 EarthBound Pottery is the custom built pottery working studio of New Zealand potter Janet Hyde. EarthBound Pottery was built twenty years ago on Te Oranga, a beautiful small farm on the slopes of Whatitiri mountain, near Maungtapere, Whangarei, to serve as a private pottery studio and a pottery teaching center with student accommodation on site. EarthBound runs pottery classes covering all aspects of pottery making from October to the end of March each year. There is a selection of intensive workshop courses available: half day, one day , two day courses or regular private tuition is available on an hourly/daily/or weekly basis for local people at a time that suits them. Check out some of the courses offered at EarthBound studios HERE..
We particularly cater for families, business team building sessions and for the holidaying or traveling public looking for something different to do. Good on site, self contained accommodation, sleeping up to seven people is available. Tutoring potter Janet Hyde has developed a fast and successful method of teaching wheelwork techniques and can successfully advance the skill levels of those who need wheel work extension. In March each year EarthBound pottery participates in The Combined Arts Workshop series in conjuction with other local artists. This is a pick and mix of one or two day workshops throughout the month of March. More information here C. A. W.
LOOKING FOR STUDIO SPACE ? For someone looking for a place to work out of EarthBound Pottery has workshop space available. This can be hired on a daily / weekly basis from October to the end of March each year or alternatively it is available to on an annual basis. The EarthBound studio shop is open to all interested visitors and customers most weekends from from mid October to Easter time. Te Oranga,s fresh farm produce is also on hand : fresh cut flowers, bouquets, farm eggs and in season fruit plus Ecoland's wooden toys.